I frequently have people ask me for planner pen recommendations. I have a very (very!) extensive pen collection. Pens are very personal (you know what I mean if you’re a paper and pen kinda gal! ), but I have enough faith in the pens I’m going to talk about today to say with confidence that these are some of the best planner pens out there. All of the pens I’m going to talk about today are pens I have purchased for myself and use on the reg. Actually, at this time, these are the only pens I’m using. That’s not to say there aren’t other great pens out there – there totally are! You might have other favorites (and there are plenty of others I like, too). But if you’re looking for the best planner pens, I can wholeheartedly recommend these. If you love planners and pens, I’d love to have you join me in my Shop Carrie Elle Planner Group on Facebook (this is also the only way to get the best discounts for my shop)! So, here’s what I look for in a good planner pen. First of all, it needs to not bleed through the pages. It needs to not skip or get gloppy when I’m writing, and it can’t be streaky. A good planner has bright, true colors, has enough ink to last for awhile, and needs a sharp point (I also like the broad-tipped pens, but I don’t like it when the point gets soft). The perfect pen also has that hard-to-describe feeling when I write with it (pen lovers, you know what I mean, right?!). Tombow TwinTone – I cannot get enough of these. Tombow sent me some pens to take with me to the Pinners Conference and now I’m an addict. They have two tips – a broad bullet tip and an extra-fine tip. The broad tip is fun to letter with, and the extra-fine tip is amazing to write with. I actually don’t think I’ve used another pen in my planner since I started using these. They also come in tons of pretty colors. If you follow my shop page on Instagram and see any planner posts, it’s likely that I was using these Tombow TwinTones. The thick tip shouldn’t bleed through the pages, although I’ve found that if I press too hard or try to color something in, I can see it through the page. I mostly use the thicker tip for my bullet journal, lettering, and adding details to my planner. I use the fie tip for all of my scheduling, note-taking, etc. I also love the Tombow brush pens…I’m learning calligraphy and the brush tips are magical! You can buy Tombow TwinTones here. Papermate Flair – Another favorite, I have these in literally all the colors. They are beautiful to write with (and also great for coloring, although I wouldn’t use them for coloring any huge projects). They have a felt tip, and as long as you take care of them (read: don’t let your husband or six-year-old use them! ), the tip stays pointy and sharp. These are another much-loved favorite, and I’ve been using them for years. I use them in my planner and in my bullet journal. These won’t bleed through the paper unless you’re coloring in a lot of space or pressing really hard. You can buy Papermate Flairs here. Pilot G2 Pens – Another one I looooove. I have an extensive collection of these. Pretty sure I own them in every. single. color. You can even read about how I use them in my planner here. You can buy Pilot G2 pens here. 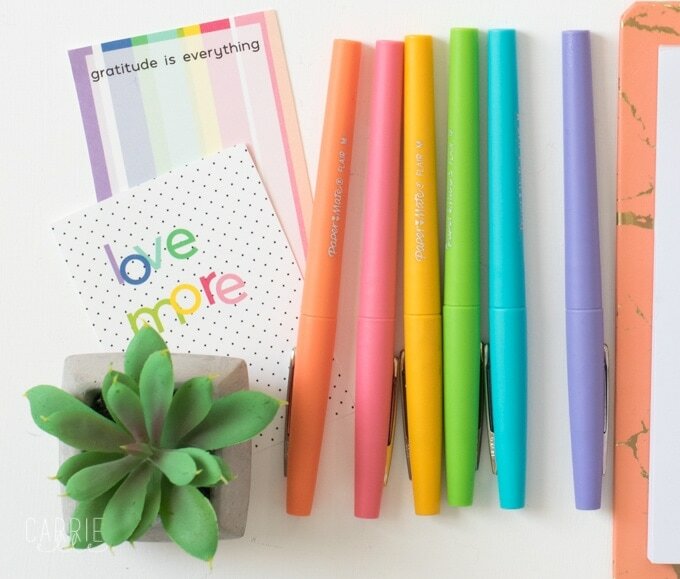 Paper Mate InkJoy Gel Pens – I also love these. My mom bought me a bunch for Christmas a couple of years ago, and I quickly went out and bought more. I’m picky about gel pens. When they work, they’re so fun to write with! But I find many of them to be inconsistent, with ink that skips and glops. These pens are not like that at all. The colors are vibrant and fun. These pens do not bleed through the paper. You wouldn’t use these for coloring, but for planners and note-taking, they’re fantastic. I use my pens until they run out of ink (and when I have a favorite, I’ll often use that pen until the ink is gone). My only complaint is that I feel like the ink doesn’t last as long as it does in some other pens (a clear window in the pen lets you see how much ink you have left). Still, for this price and at this quality, I don’t mind buying more (and the black one is the only one that has run out of ink…after very consistent use). You can buy Paper Mate InkJoy Gel Pens here. Have you tried any of these? What are your favorites? If you’re a planner girl, be sure to join us on Facebook for fun planner-y stuff, free printables, and healthy recipes. I’d also love to have you in my planner Facebook group! I absolutely love the frixion ERASABLE pens!! Come in all kinds of colors and if you make a mistake you can erase it!!! These are on my list to try! I can’t believe I’ve never tried them before, because I’ve had several people recommend them! Omg!!!! I love most of these but I am totally a G2 girl! I almost passed out when I saw the G2 mechanical pencils!!!!!!! They are LOVELY. And the mini G2 mechanical pencils are amazing too. There’s nothing better than a good marker, pen or pencil! Right?! I love me som pretty G2s!